Thanks to Transmission Films here is your chance to win one of 20 x in-season double-passes to BREATHE. Andy Serkis (War for the Planet of the Apes Star Wars: The Force Awakens) makes his feature directorial debut with BREATHE. 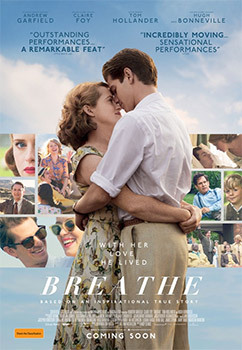 Based on a script by twice Academy Award-nominated writer William Nicholson (Everest, Les Misérables and Gladiator), BREATHE is an inspirational true story of love without limits. Adventurous and charismatic, Robin Cavendish (Andrew Garfield - Hacksaw Ridge, Silence) has his whole life ahead of him when he is paralysed by polio whilst in Africa. Against all advice, Robin's wife Diana (Claire Foy - Golden Globe Winner, The Crown, Wolf Hall) brings him home from hospital where her devotion and witty determination transcends his disability. Together they refuse to be imprisoned by his suffering; dazzling others with their humour, courage and lust for life. BREATHE is a heart-warming and highly emotional celebration of bravery and human possibility, a love story about living every breath as though it's your last.